Like other integrations, you need to be an admin in order to enable the Clearbit integration. The Clearbit integration displays rich customer and company profile information for matching email addresses in Front. With this data at your fingertips, you can reply with more context and make sure every email is in the right hands in Front. Go into your Settings, select Integrations, and click on Clearbit. Click on Settings, then turn the toggle on to enable Clearbit. Click Save. Open your integrations panel by clicking on the arrow located on the top right corner of your Front inbox. Click on the blue Sign in button, and log in with with your Clearbit account credentials. 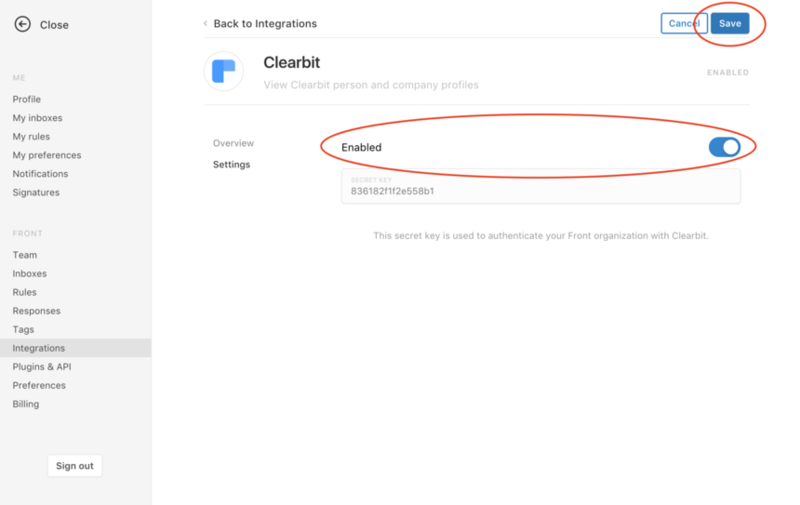 If you don't already have a Clearbit Enrichment account, you will need to sign up with Clearbit to use this integration. 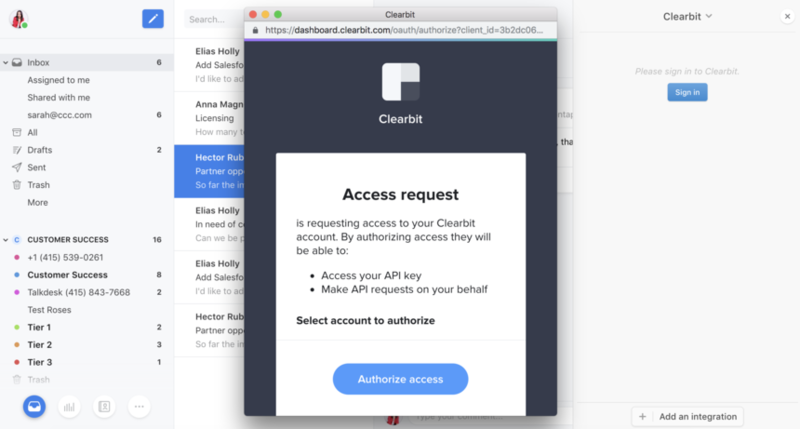 Grant Front access to your Clearbit API Key by clicking Authorize access. Now, you will be able to see any matching Clearbit profiles tied to the selected email conversation in Front. 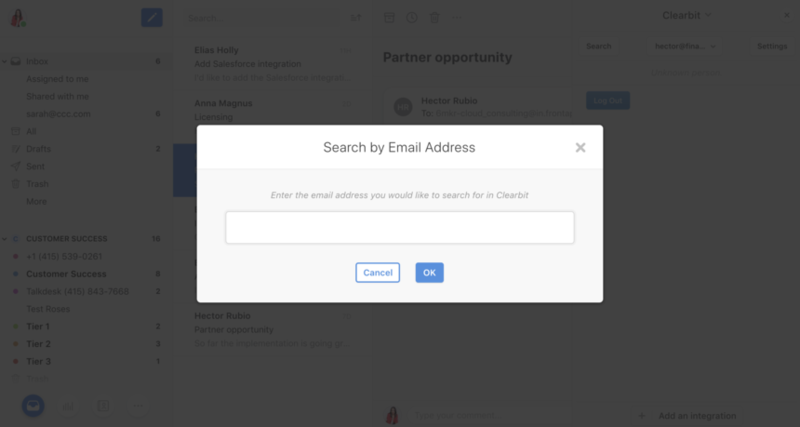 Clearbit requires an email address to search for matching person or company profiles. 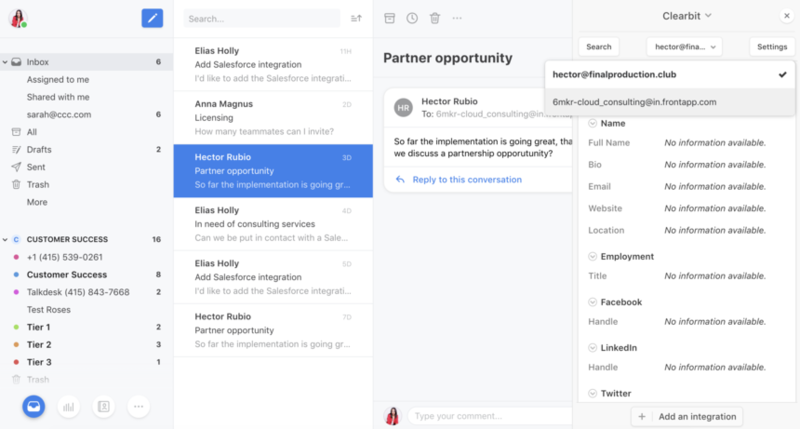 If the conversation type is email, Clearbit will display the matching records. 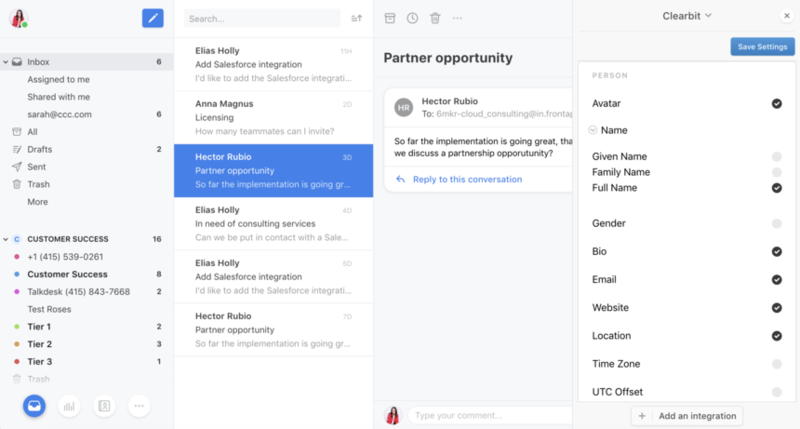 If there are multiple people on an email thread, you can toggle between records by selecting an email address from the dropdown menu at the top of the integration panel. For conversation types other than email (such as Twitter, SMS, chat), Front will try to find a match for you. If the sender handle exists as a Front contact, and that contact record also has an email address, Clearbit will search against that email address. If the sender handle doesn’t have an associated Front contact or that contact doesn’t have an email, Clearbit will not be able to show any profile data. You can also customize what fields the Clearbit plugin displays by clicking on the Settings button in the top right corner of the integration panel. From here, check or uncheck the fields you want to be displayed in Front. Lastly, you can manually look up any email address in Clearbit by clicking the Search button in the top left of the plugin.